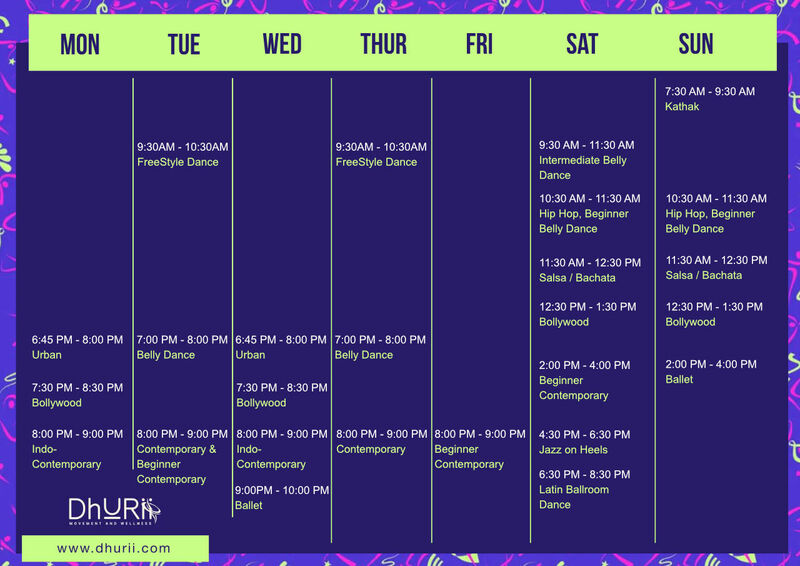 These classes cover basic contemporary technique, floor work and focus on building the movement repertoire required. If you have never tried Contemporary or any dance form but have the curiosity, this will work great for you. Classes shall work around technique routines followed by choreographies. Our contemporary dance classes cover contemporary technique, floor work and Flying Low. Structured with the necessary warm-up to build strength and flexibility, choreographies based on various genres of songs including international hits or some lovely Indian music, these classes are ideal for intermediate level students. Indo Contemporary dance is a fusion between contemporary, bollywood and the Indian classical form. Ideal for those who are looking to explore contemporary dance for the first time or dance itself for the first time. The classes shall be structured with the requisite warm up, technique work, choreographies based on popular, energetic and soulful songs. Kathak is one of India's primary classical dance forms. With it's many schools of teaching, each specialising and bringing out their own flavors, the form is mesmerizing with its elegance and energetic movements. Taught in an authentic manner, the classes are suitable for beginners and intermediate students. Ballet dance class is a great way to start with techinique training that will form the base for your dance over time. The classes focus on building mobility, flexibility and ballet technique. The Bollywood dance classes are for adults and are based on popular bollywood numbers. If you love a song, ask your instructor and we the next choreography can be on that song. Jump in, have fun and dance your heart out. Ideal if you are looking for a fun session and you love to move to your favorite music. No prior experience required. Just walk in. Hip Hop is the iconic dance form which grew with the whole hip hop culture and has some of the most fun and high energy moves as well as the sharp, small moves with an element of swag. These classes shall cover all of House, locking, popping and other techniques. Great for beginners and intermediate students. Urban dance classes shall focus on Urban choreographies and is a great choice if you love a chill movement style. Urban builds on various techniques from hip hop, jazz, contemporary etc and focuses on musicality, precision of movement and bringing out the feel of the music expressed using the amazing body control you will build. Classes shall drill techniques and follow it up with combos and then choreographies. Classes shall also work on performances techiques including expression, stage sense, synchronisation as a group etc. These classes shall focus on basic technique in belly dance based on multiple styles including oriental, afro, tribal fusion etc. Classes shall drill techniques and follow it up with combos and then choreographies. Classes shall also work on performances techiques including expression, stage sense, synchronisation as a group etc. These classes are for those who have completed the beginner level. Classes shall build further on technique in various styles and focus on mastering movement and body control. Classes shall add further techniques and follow it up with choreographies. Freestyle dance is a chill dance form oriented more towards hip-hop styling. The classes shall proceed on choreographies made to new and popular upbeat songs to keep you super alive. This batch shall cover both Salsa and Bachata with focus on social dancing. Classes shall focus on musicality, technique and choreographies oriented towards making you comfortable in leading / following with style. Suitable for beginners and those with some basic learning / experience. This is a pre-bronze and bronze level batch in Cha Cha, Jive and Samba which are ballroom dance forms of Latin. Each form comes with its open special flavor of music, step work, technique, feel and beauty. Works perfectly for beginners or those have have just had a short stint with it. 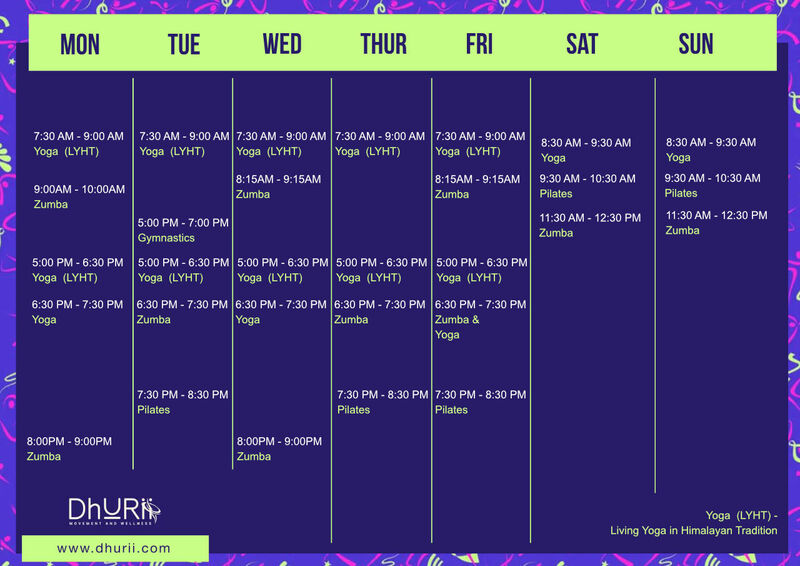 Zumba and cardio conditioning classes are our take on a dance cardio workout that combines Zumba with some fun elements, your favorite international music, an intelligent heart rate boost and cool down towards the end to ensure you can sustain it as a lifestyle. We take special care give you inputs regarding alignment etc to ensure you avoid injuries. Come and join the fun workouts. Hatha Yoga is the physical element among the 8 fold path of yoga. In our classes, you will get to learn the various postures, improve your body balance, control, alignment, flexibility and strength. With variations introduced to suit your specific lifestyle related issues, our Hatha yoga classes shall be an ideal ground to get started with your physical wellness. The focus in the yoga classes are on Asana and Pranayama, Strength and Flexibility, Deep meditation and Relaxation as well as finding an inward spiritual connect. Pilates is an excellent option for those looking to build core strength, balance as well as those looking to recover from injuries, lower back, knee aches etc. With isolated movement and focus on building strength in various muscles, Pilates done on the Mat is a slow and yet effective way to keep yourself fit. Ideal for those who wish to avoid cardio sessions but still seek strengthening. The gymnastics classes are designed for kids and young adults. Gymnastics is a great way to build strength, flexibility and body control from an early age and while providing a great sense of exhilaration and achievement. These are one to one sessions using alternative healing modalities such as Hypnotherapy, Chakra reading, Redikall healing, body visualisation, pranic healing or angel card reading to heal and work with physical ailments, emotional issues and patterns in life. These are available only through prior appointment.